Of all the filmmakers that director Martin Scorsese could cite as a key formative influence on his own art—filmmakers like Roberto Rossellini or Vittorio De Sica—he keeps coming back to one in particular: Elia Kazan. A fellow New Yorker, Kazan was a kindred spirit to Scorsese, helping the young director understand his own place in the world through powerful, staggering films that explored the hardened men and women of the American immigrant working class. 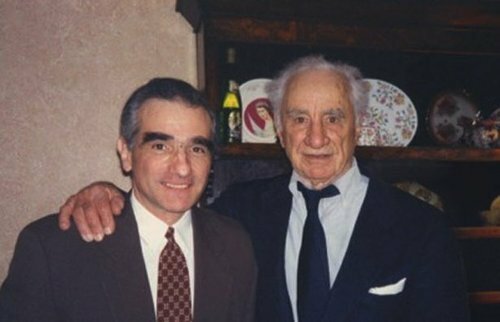 After a series of documentaries paying tribute to the midcentury American and Italian films that inspired him to pursue filmmaking as his vocation, Scorsese collaborated with co-director Kent Jones on a documentary that zeroed in on Elia Kazan’s work and legacy in particular. Much like A PERSONAL JOURNEY THROUGH AMERICAN MOVIES (1995) and MY VOYAGE TO ITALY (2001) before it, 2010’s A LETTER TO ELIA blends a series of film clips and stills to illustrate how profoundly Kazan affected Scorsese’s worldview and established a standard to which he still holds himself to today. Narrated by Scorsese himself (an endearing touch that recurs throughout his documentaries), the film goes into detail on three works in particular—ON THE WATERFRONT (1954), EAST OF EDEN (1955), and AMERICA AMERICA (1963)—and explains why they best embody Kazan’s unique worldview and artistic fascinations. Despite being about another filmmaker, A LETTER TO ELIA can’t help but bear Scorsese’s mark when it explores how Kazan’s Greek heritage informed and shaped him as not just an artist, but as a man. After all, the same thing could be said about Scorsese himself and his cinematic chronicles of the Italian immigrant experience in New York City. 2010 was a relatively prolific year for Scorsese, but not in the way that one might immediately suspect. The year saw him release a feature film, a television pilot, a commercial, and two documentaries. Ironically, this increased output happens to coincide with a general slowdown in the pace of his feature film delivery. Yes, SHUTTER ISLAND (2010) was quickly followed the next year by HUGO, but there’s a two year gap between HUGO and WOLF OF WALL STREET (2013) and a void of four years between THE DEPARTED (2006) and SHUTTER ISLAND. The slowdown is probably not attributable to Scorsese’s old age, like some would naturally think—we’re seeing instead the trickle-down effects of a much larger movement in the film industry. This particular climate was born from the onset of the Great Recession in 2008, a recession that hit the film industry hard and made it significantly harder for even prestigious directors like Scorsese to find financing for their projects. This climate continues to this day, and while other filmmakers have simply withered on the vine, Scorsese’s inherent nimbleness and resourcefulness have allowed him to recalibrate his approach and pave the new for a new generation of filmmakers, all while safeguarding the principles and legacy of the generation that preceded him. A LETTER TO ELIA is currently available as a high definition rental on iTunes.